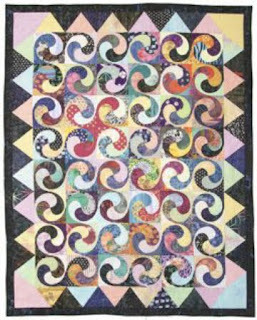 I've learned lots more about the swirl pattern I showed in my February 8th posting. Denniele remembered an old example from the Indiana Quilt Research Project Book, Quilts of Indiana, in which they showed a picture of the one above, possibly made in Connecticut about 1890. 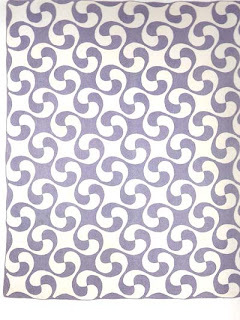 "This blue and cream swirl pattern rates as the most unusual pattern among the over 6,400 quilts registered by the IQRP." 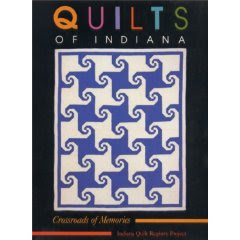 The curved swirl looks a lot like the Indiana Puzzle quilt on the cover of the book. A few people wrote to say they'd made one, either obtaining the pattern in a class or using templates for the design sold by the Ardco template company. Sally Ickes made the quilt below in a class. 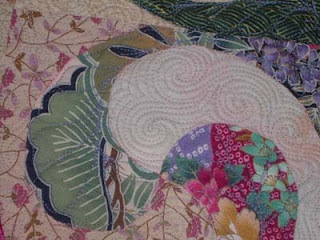 She used Japanese-inspired fabrics. I found the version below at Jane's Fabric Patch where they teach a class. Bobbi writes to say the pattern was in the April 2004 issue of Quilters Newsletter as "French Twist." Not difficult? Are you sure? ;) Wondering if I could tackle it. While the mutli-print one is pretty - to my eye, the 2 colors quilts just dance across the screen. Are you sure it is easier than it looks? It definitely changes perspective and movement, by changing the colors around. It reminds me of waves, really nice design. I'll stick to the Indiana Puzzle pattern. I've made the French Twist version and it isn't difficult....it's applique! Piecing would be another story. I just found a book at a Guild yard sale called All Quilt Blocks Are Not Square by Debra Wagner, 1995. 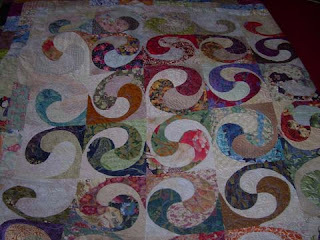 And in it was this swirl quilt. She called it Candy Swirl. Love it, can see where applique would be the way to go. Can't imagine trying to machine piece it! My sister and I have been looking for this pattern for years. We have great-grandma's quilt and have never seen a pattern for it. To find a picture of the quilt and a link to the template all at the same time is beyond wonderful.